The nation’s home-ownership rate is also falling, to 67% of U.S. households in 2010, after topping 69% in 2004, according to the Census Bureau, with further declines expected. Each 1% decline represents one million households moving to rentals, housing experts say. Renter households now top a record 37 million after increasing more than 3.5 million in the past five years, partly due to the foreclosure crisis. Green Street Advisors expects an additional 4.4 million rental households to be added by 2015. Part of this increase is fueled by the transfer of owners to renters and part of it is undoubtedly fueled by the tightening credit markets that will produce longer term rents, particularly among the young in expanding markets. It is hard not to think about tenants in Toronto. At best only 50% of the city is composed of homeowners and estimates are only a little better than 60% in the greater Toronto area. In the neighborhoods where ACORN Canada organizers virtually everyone is a tenant in one high rise complex after another. The longest running organizing campaign not surprisingly has been the effort to win what we call, “landlord licensing,” which would be a process of licensing (and de-licensing) based on inspections (which would lead to repairs and improvements) and finally assure our tenants safe, decent, and even affordable housing. In this long running battle the real estate interests cry like stuck pigs at our every proposal, but there has been sure and steady progress. Last year winning a better auditing and inspections process, even though far short of licensing, according to the City of Toronto housing department led to $100 million in landlord upgrades and improvements. 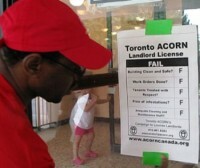 Now ACORN Canada is trying to secure another small, but significant victory in this guerrilla campaign where a box would be required in the lobby of all major apartment complexes where the audit reports and improvements would be available to any tenant seeking to rent creating a transparency that would hopefully steer tenants towards better properties and shame landlords into making needed repairs. There’s no way to imagine cities with burgeoning numbers of tenants who will no longer be seeing apartments as way stations to homeownership but increasingly as permanent addresses and not realize that the long imbalance where landlords have held the upper hand and tenants in most cities and states have been virtually stripped of any rights, as a time bomb ticking. New construction of apartment blocks is being accompanied by rental inflation, so there are bound to once again be calls for controls if (when?) greed laps past demand, but perhaps even more urgently there will need to be tenant rights campaigns, like the ones in Toronto, to secure basic housing decency for the millions and millions who now understand that apartments are central to the urban future. Toronto All afternoon I kept overhearing snippets of conversation about the action with a housing committee at City Hall that evening. It was a deputation? No, it was just lobbying to keep them on track. It was important? No, it was just another exercise in keeping the City of Toronto on track to finally put teeth in the landlord licensing law. Are you going, Wade? No, I don’t think so. I couldn’t figure it out, and I had plenty of things still on the list. What did I know! When Judy Duncan, ACORN Canada Head Organizer, and I talked with the Toronto ACORN Field Director Tatiana Jaunzems and Organizer Shauna Harris after everything was said and done, there was a whole different story as the details emerged. They were super charged! It turned out that there were 30 ACORN members at the committee meeting with 10 other allies and they had dominated the affair and seized the opportunity to advance the agenda. When the crowd was broken into work groups to prioritize what needed to be done next, our teams were well organized and efficient and “bullet voted” their top priority so that a long standing issue could no longer be ignored. We were all about the box. Like any classic community organizing issue it almost seems too simple a demand to be taken seriously, but that’s precisely the beauty of it. We were demanding a box, and we would not be satisfied with anything else. Every time the discussion started to veer one way or another, according to the organizers, we then herded it back into the corral by arguing the box would solve the problem. We were on our game and playing our card in every game until it became the trump. When the City Councilor heading the committee finally said, the one thing we are all clear on is that we need to make the box happen, but can we discuss some of the other issues, the ACORN members knew they had finally come around the corner and would win the box. Ok, you are now as confused as I was, so let’s think out of the box. Under the landlord licensing law that Toronto ACORN won in recent years for tenants, there have to be inspections by the city of the housing complexes. In the first year we were livid. Hardly a hundred buildings were inspected. We went crazy and were all over the City for dropping the ball here. The commitment increased tenfold. All good! But, once the inspection was finished there was a problem. How would existing tenants or prospective tenants know what problems the building had and, perhaps more importantly, check and make sure the needed repairs were being made by the landlords? Solution: the box of course! We were demanding that there be an official City of Toronto box constructed or placed in the lobby of all inspected buildings so that all the tenants would be able to access the report and keep pushing the landlords to make the repairs or in the case of prospective tenants, not move into the complex until they saw that the repairs had been made. It was all elegantly simple. Without an inspection tenants had no collective leverage on the landlord for fines or broken regulations. But an inspection was meaningless if there was no transparency so that the tenants themselves were empowered to be able to constantly push both the landlord and the city to make the repairs and improvements. And, you guessed it, there was only transparency if there was a box that was placed permanently in the lobby so that all the inspection reports could be protected and available for all the tenants to constantly consult and make sure rules were followed and therefore justice was done. 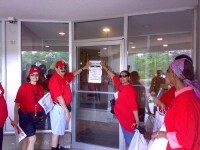 Turns out for Toronto ACORN it was thinking in the box that would guarantee change for tenants.